This canoe shaped glass vessel sink from Eden Bath is made of high quality tempered glass. This glass sink featured a mix of foil colors (with golds/reds/browns) attached to the exterior of the sink. 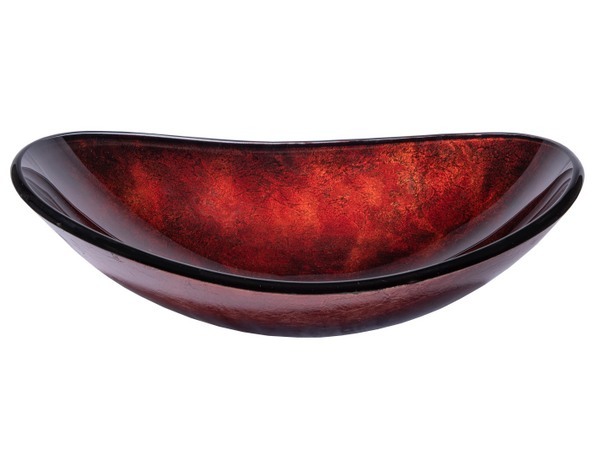 This creates a unique dark red copper textured appearance in both the bowl and on the exterior of the sink. The narrow width (front to back) of the sink make it a perfect option for counters where counter depth is limited. We recommend that you also purchase a mounting ring and drain with your glass sink in the same finish of your faucet. Outer Dimensions: L: 21.25" x W: 14.25", H: 4.75-6.75"